Freshly-painted golden helmets, glinting in the sun. Jerseys of deep, rich blues and stark, crisp whites: simple, unadorned but for a small interlocking ND, numbered yet nameless. Flat-finish pants, golden-brown, almost dun-colored. There is no better feeling for Fighting Irish fans than to be sitting in Notre Dame stadium on a fall afternoon waiting to see those pristine Golden Domes above navy blue jerseys emerge from the tunnel and run out onto the field. It's not just a game anymore, it's reliving tradition. Of course, the uniform is more than simply the clothes you wear when you play the game, and more than just your battle insignia that tells you apart from the other team...it's also a tie to your cultural heritage, your own personal link to the past. After all, when you think of a football team, the first thing you remember is its colors, its unique coat of arms: Michigan's winged helmet, for instance, Alabama's classic white numbers on crimson, Penn State's martial simplicity. These cultural signifiers are as important to a team's identity as its nickname and its mascot. And when you put on the mantle of your alma mater, you're wearing the tradition of hundreds of players and fans to go before you. It's funny, though. 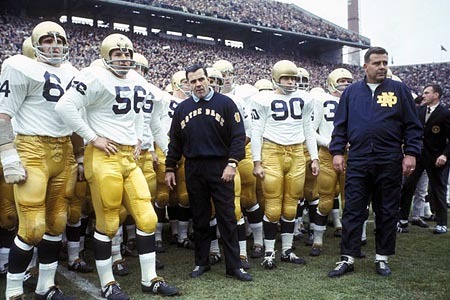 As traditional as we think ND's uniforms are today -- and they've been largely unchanged for a while now -- we've actually had quite a variety of interesting styles since the early days of football at Notre Dame. 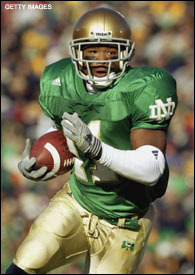 Two-tone jerseys and shamrocks on the helmet; names on the back and logos on the front; stripes, and flanks, and little blue stars have all made appearances at various times throughout our history. I've always been interested in sports uniforms and logos...so, I thought I'd explore the history of the ND uniform, and see if I couldn't piece together the evolution of, well, tradition. Let's take a look. Very little research material is available on the very early Notre Dame uniform. 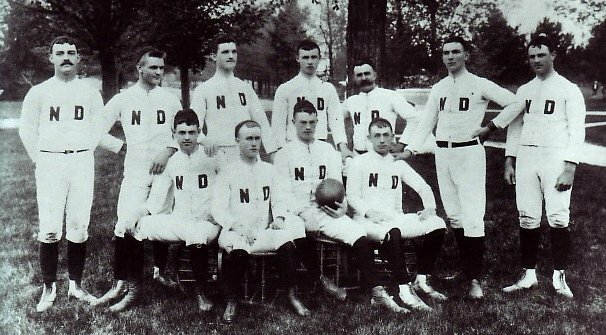 The first ND team, in 1888, wore an all-white uniform with an "ND" written across the chest (right). It is around this time when the blue and gold colors became the official school colors. At the time of its founding in 1842, Notre Dame’s original school colors were yellow and blue; yellow symbolized "the light" and blue "the truth". However, sometime after the Dome and Statue of Mary atop the Main Building was gilded in 1886, blue and gold became the official colors of the University. In 1914, ND coach Jesse Harper scheduled a game against the Pop Warner-coached Carlisle Indian School. 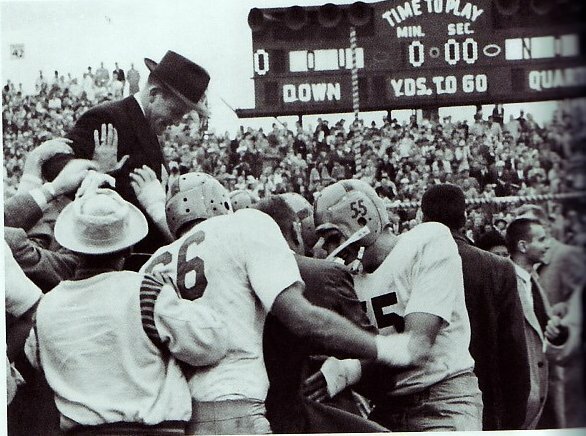 The game was to be played at Chicago's Comiskey Field and believe it or not, it was considered a very important game in Notre Dame's quest to become a national college football power. To render the game more attractive to spectators, Harper decided to have the players wear numbers, and he wrote Carlisle asking for a list of their players and the numerals that Warner would assign them. Rockne is often credited with this innovation but he merely copied what he observed as Harper's assistant coach. The first uniforms of the 20th century were very simple, a dark blue jersey with no numbers or logos. The now-familiar interlocking ND logo seems to have made its debut around this time on letterman sweaters. 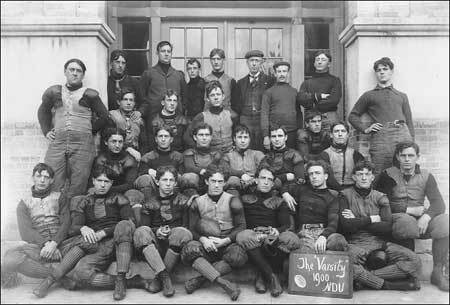 Seen here on Rockne in 1913, as well as on George Gipp’s sweater now on display in the Reagan library (below right). 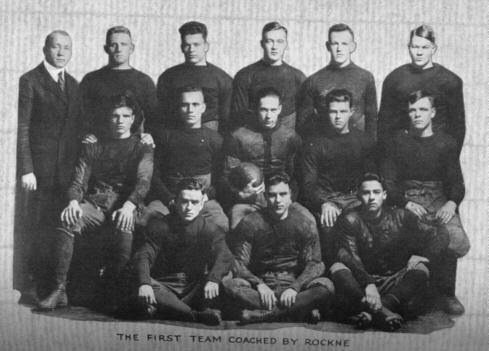 Rockne’s first team wore the simple blue jerseys that he had worn as a player (below left). 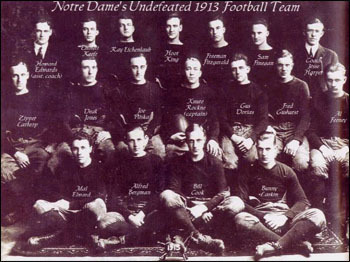 In addition, the green jersey is believed to have made its debut during Rockne’s tenure when he assigned them to the freshman team, while the varsity squad wore blue. 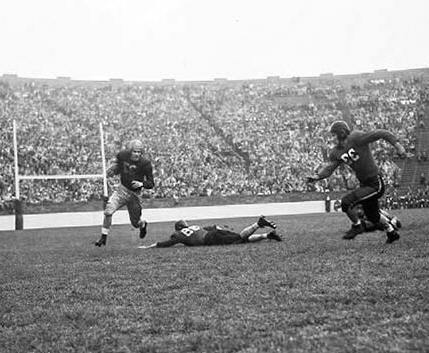 The green jersey then made its debut for the varsity team, when it was worn in the early 20’s simply for purpose of distinction when the Irish opponent also came out in blue. 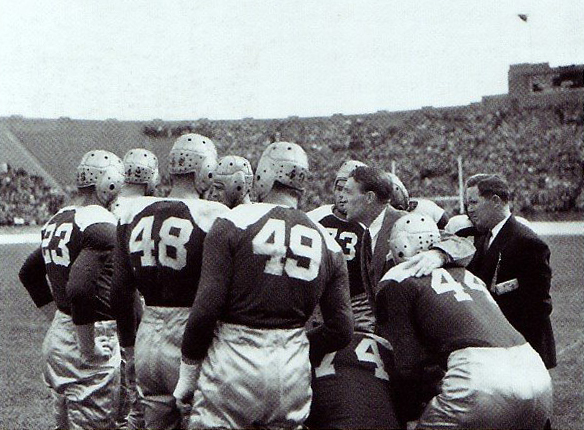 "The ND coach prepared a number of surprises: to help his passers see their targets better and his ball carries locate their blockers more easily in the Yankee Stadium twilight and against the dark Army uniforms, he substituted bright green outfits for the regular dark blue Notre Dame suits; he also changed the players' numbers from those he had sent to Harry Stevens for the game program, thus confusing the fans, the press corps, and, he hoped, the Army coaches." 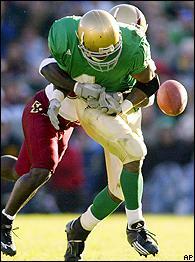 The green uniforms also helped the Fighting Irish nickname gain momentum. The New York Herald-Tribune reported that when the team ran onto the field, the "Celtic representation" in the crowd "took to this display of green immediately and cheers from all their sections" arose. 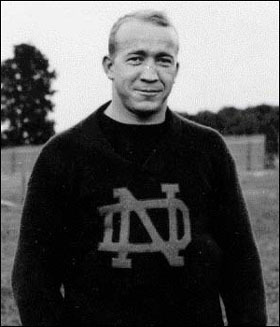 Throughout his career Rockne continued the practice of having his players switch uniform numbers for big games against Army and Navy in order to confuse the opposing team. This prompted several New York newspaper columnists to chastise the coach for having his players wear uniform numbers that did not correspond to the official program. 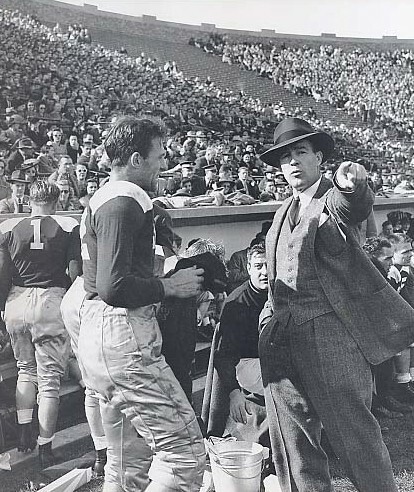 Frank Leahy’s first game as head coach, versus Arizona in 1941, featured an unusual two-tone jersey, modeled here by Angelo Bertelli (left and below). 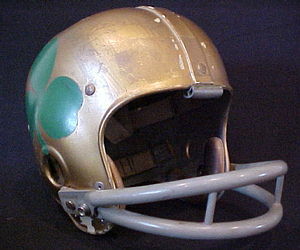 At the time, the Irish also donned leather helmets with the player’s number on the back (below left). It is unknown whether this jersey was worn again, but with his 2nd game against Indiana, the uniform returned to solid blue (right). Also, if any of our readers are aware of the two-tone colors, please let us know. It's hard to tell exactly when the fabled gold helmet first made its appearance, but we do know that Leahy painted the helmets gold for at least part of his tenure, and they've been in use in one version or another ever since. Leahy was also quite fond of the green jersey and his squads wore it often, some years exclusively. 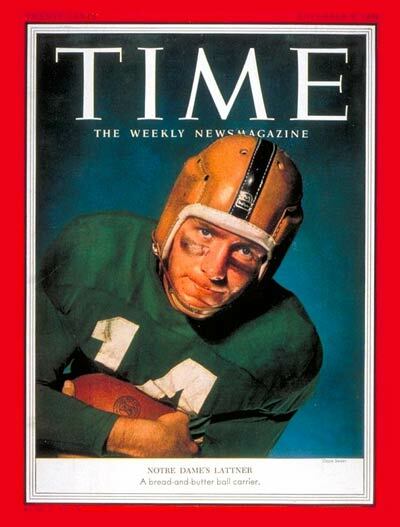 Bertelli in ‘43 (below), Johnny Lujack on the cover of Life magazine in ’47 (below), and Johnny Lattner on the cover of Time magazine in ’53 (right), all wore the green jersey those years. Notice the black stripe down the center of Lattner’s gold helmet. 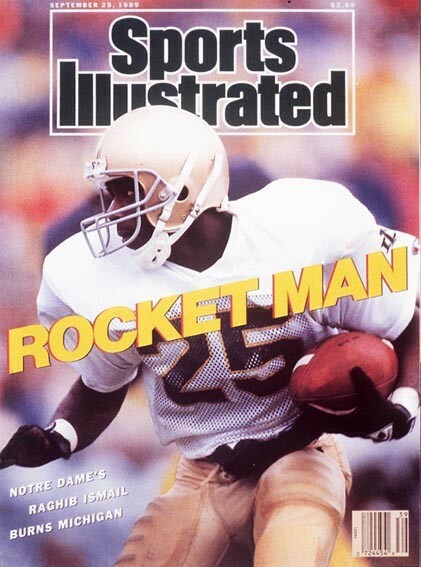 I found it interesting that Notre Dame football players once graced the covers of national magazines such as Time and Life. Would we ever see this again? 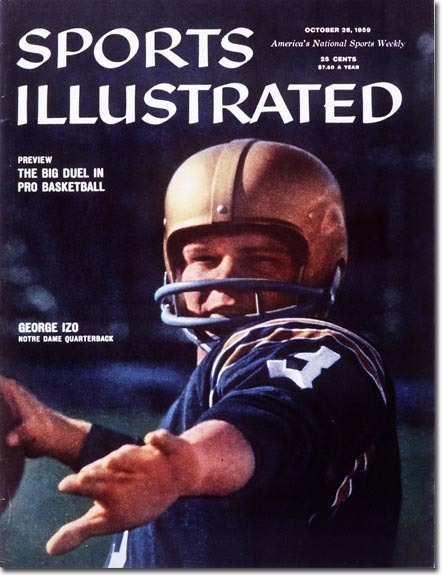 Terry Brennan continued the practice of wearing green almost exclusively as seen here on Paul Hornung in a 1956 issue of Sport Magazine (left). 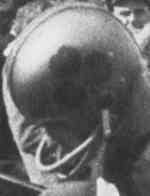 The leather helmets during this time featured 2 dark stripes: one going from front to back, the other from side to side. 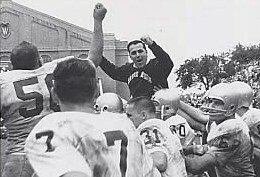 The number of the player also appeared on both sides of the helmet as seen here in the celebration of Notre Dame's upset of Oklahoma in 1957, ending the Sooners' 47-game winning streak (right). 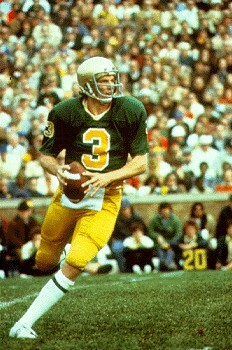 Joe Kuharich made the most drastic changes to the uniform than any Notre Dame head coach before him. 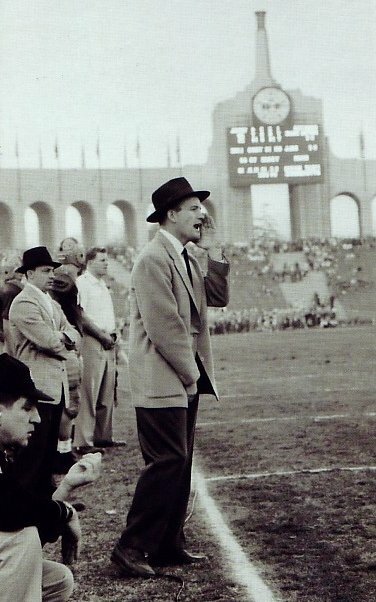 In 1959 Kuharich added gold UCLA-style shoulder stripes to the jerseys along with a shamrock on the sides of the helmet (below). The shamrock is of particular interest since it’s one of only 3 designs to appear on the side of a Notre Dame helmet. Kuharich returned the primary uniform color to blue, after an absence of many years. 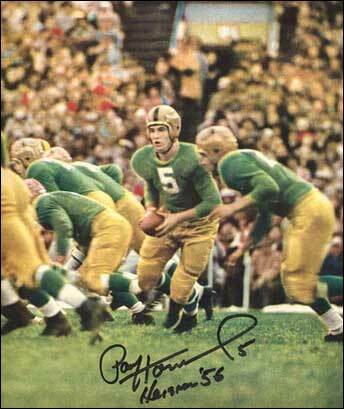 However, he still broke out the green jerseys on occasion, still featuring the gold shoulder stripes. During Hugh Devore’s one-year stint in ’63, he kept the shoulder stripes but replaced the shamrock on the helmet with Alabama-style numbers (right). Even after wearing navy blue all season, Devore switched to green in the finale against Syracuse at Yankee Stadium. 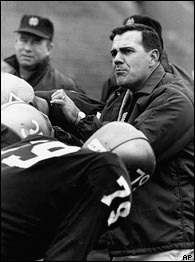 Ara Parseghian changed the uniform to a very simple blue home jersey and white away jersey, with the player’s number on the sleeves. The photo on the left must have been taken during the spring practice or in the fall before the first contest, because the Hugh Devore numbers on the helmet were gone by Ara’s first game versus Wisconsin (right). The stripes and shamrocks from the previous coaching regime were also removed. Notre Dame has continued to use the plain gold helmet ever since, which makes it the longest-running unchanged helmet design among the NCAA Division I-A colleges. 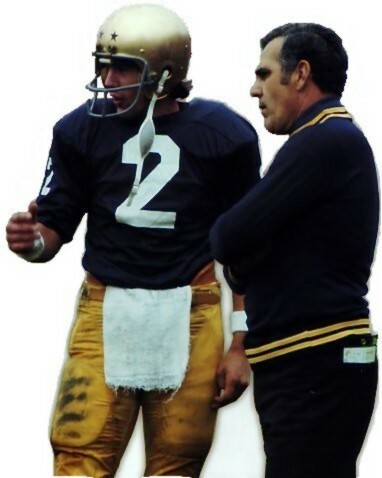 Ara would keep these simple jerseys for his entire tenure, never once having his squad wear the green jerseys that were so favored by previous Irish coaches. There are at least 2 games where Ara’s squad wore jerseys with names on the back. 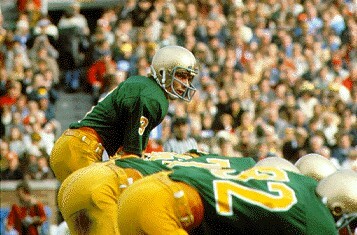 The ’73 Sugar Bowl and the ’75 Orange Bowl featured the Irish clad in jerseys with names. The names are believed to have only been used in the bowl games since the names did not appear on in regular season games, such as ’73 USC. Ara did institute one unique change to the ND helmet; he handed out blue stars for big plays, a la the Ohio State Buckeye (right). The 1-inch stars were stenciled on the front of the helmet. At first, the stars were given out only to defensive players for recovering a fumble or getting an interception, but this changed sometime around ’71 or ’72 when the awarding of the stars was extended to offensive players such as Tom Clements (right, below). Dan Devine made 2 changes to the uniform; he discontinued the use of the blue merit stars and he added names to back of the jerseys (left). 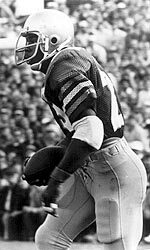 Devine’s major mark on the history of the ND uniform would come on October 22, 1977 in Notre Dame Stadium. The 11th-ranked Irish were taking on 5th-ranked USC in another important battle between the two rivals. The spirited students made an enormous Trojan horse and Coach Devine pulled out his biggest trick: after warming up in standard blue jerseys, the ND players stormed the field for the game in green jerseys (right). 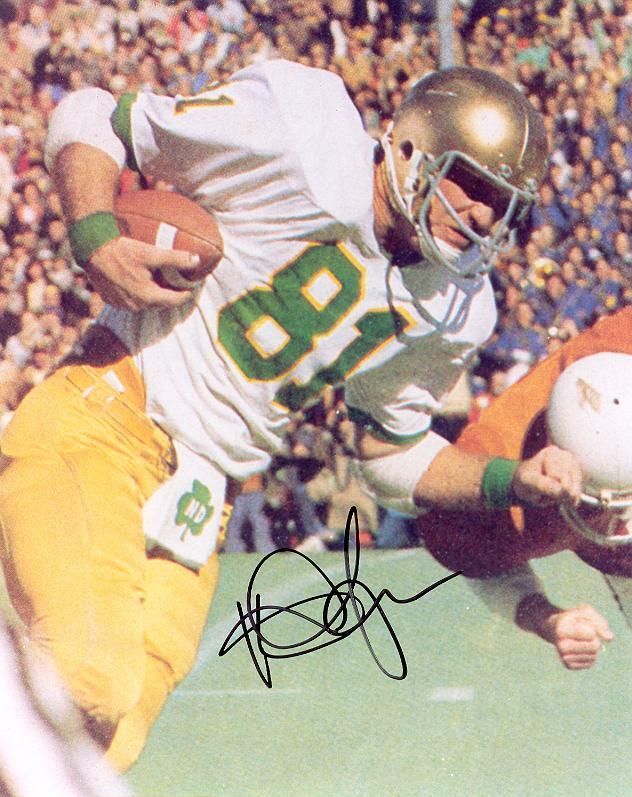 Led by Joe Montana, the Irish went on to destroy USC 49-19. 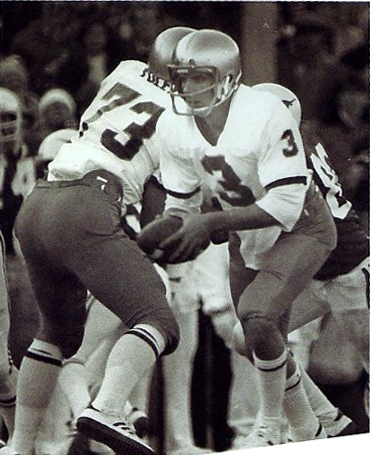 Notre Dame would wear the green jerseys with gold numbers through the rest of the season, including the 1978 Cotton Bowl that gave Devine his one and only national championship (below left). The jerseys worn in the USC game did not feature names on the back, but names were added sometime before the Cotton Bowl. 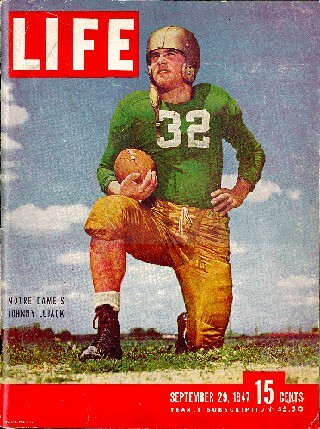 Devine would outfit his squad in the green jerseys throughout the rest of his time at Notre Dame. 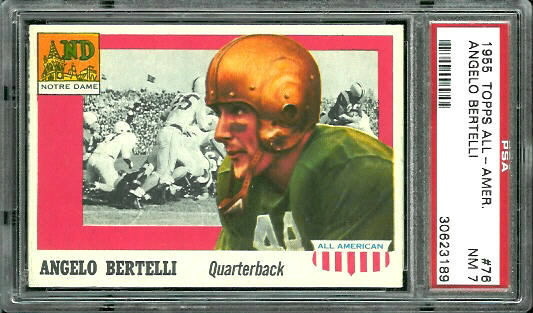 With the arrival of Gerry Faust the Notre Dame uniform went through another rather drastic change. Not only did he do away with the green jersey that was worn during the last half of Devine’s career, but he also decided to change the shade of blue from the color worn during the Parseghian years. 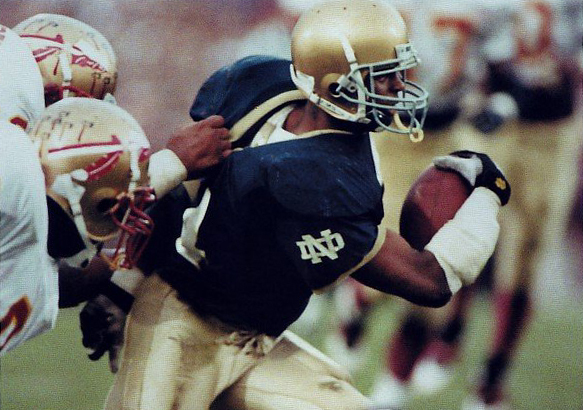 The new Irish coach suggested some research into the University archives to determine the history of Notre Dame’s gold and blue colors. Those findings indicated the blue color was actually Madonna blue, a light blue shade, as opposed to the navy blue shade that had been most common in recent Notre Dame uniforms. The royal blue jerseys featured three one-inch stripes on the sleeves, two gold surrounding one white. The away jerseys also had 3 stripes, two blue surrounding one gold. The stripes were eliminated on the ’84 tops, which didn’t feature any trim other than the white numbers on the navy blue shirts. Faust also continued the practice of having player’s names appear on the back of the jerseys. Faust made use of the green jersey on two occasions. He outfitted his squad in green in a 27-6 win over USC in ’83 - six years to the day after Devine first went to the green in a win over those same Trojans. 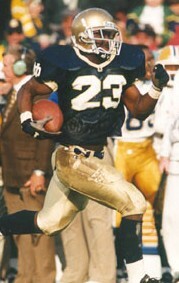 The Irish also wore green during the second half of the 37-3 win over USC in ’85. 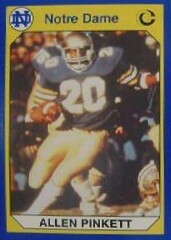 Lou Holtz made a few changes to the uniform beginning in ’86. These involved adding the interlocked Notre Dame logo to the shoulder of the jerseys (replacing the numbers) and to the left front side of the pants. Holtz also removed the names on the jerseys that were featured by the previous two coaching regimes. 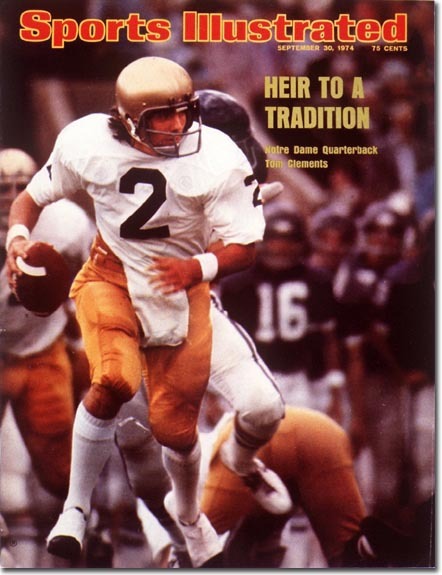 Holtz's uniforms were largely a throwback to the era of Ara, and the Irish would wear this uniform through 1991. Champion was the manufacturer of the uniform and in ‘92 they made a couple of additions to the jersey. These changes came in the form of a gold sleeve edging, a gold collar, and a small Golden Dome stitched at the bottom of the “V” on the collar (below left). At the same time the away uniform had a blue sleeve edging and a blue collar added. 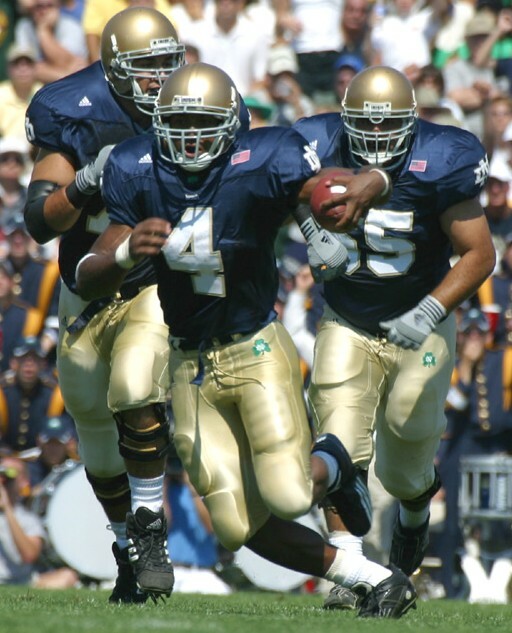 Another minor change was made when the color of the small interlocking ND logo on the front of the pants was switched from blue to green beginning in ’95. 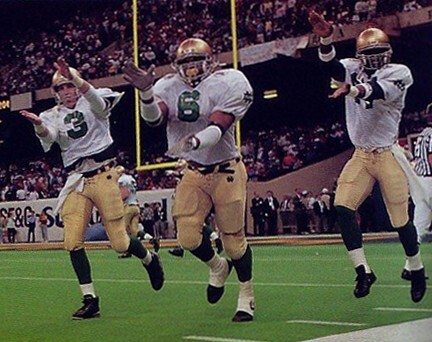 Holtz hauled out the green twice, the first time in the 1992 Sugar Bowl when the Irish donned white jerseys with green numbers and green socks (bottom right). 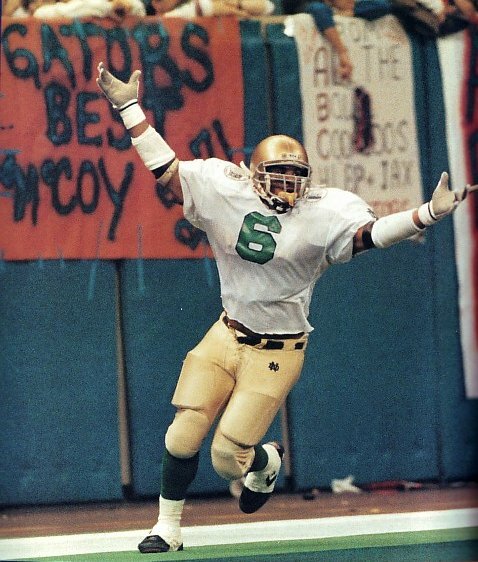 With the help of 3 touchdowns by Jerome Bettis, the ND went on to defeat #3-ranked Florida 39-28. 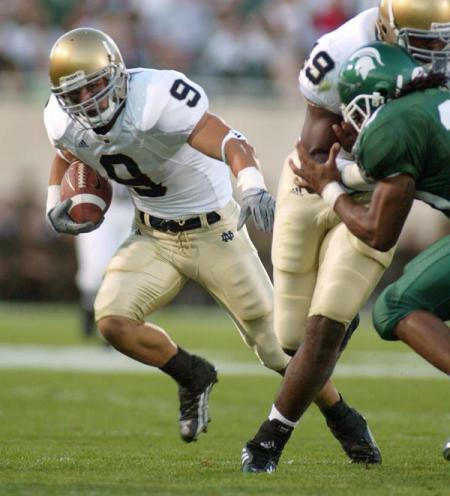 The last time the Irish had worn their road white jerseys with green numbers was in the Superdome in Notre Dame's loss to Georgia in the Sugar Bowl 17-10, exactly 11 years earlier. 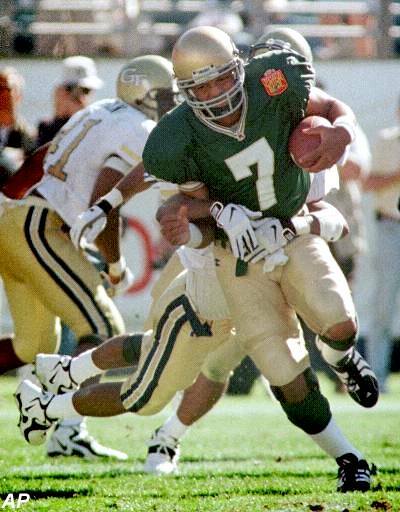 Notre Dame again wore green jerseys for Lou in a 41-24 loss to Colorado in the ’95 Fiesta Bowl. Under Bob Davie, the Champion-made jersey underwent a slight modification in ’98 when the piping on the sleeves and collar was changed to a gold/white/gold stripe pattern (left). The uniforms stayed unchanged through the first few years of Davie’s career until 2001 when Adidas was given the contract to manufacture the uniforms, replacing Champion. 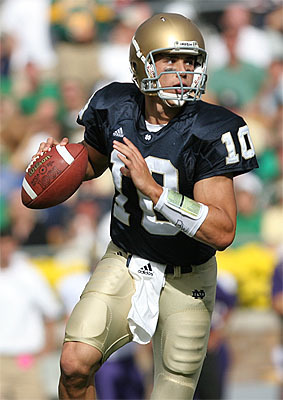 The home jerseys remained similar to the Champion jersey, except for the addition of the Adidas logo to the right shoulder, a small shamrock replacing the Golden Dome at the “V” in the collar, and a script “Irish” appearing under the shamrock. Notice that a small green shamrock was also added to the left front side of the pants, replacing the standard interlocking ND logo. The American flag was added to the left shoulder and the back of the helmets in remembrance of the September 11th tragedy. The 2001 away uniforms also underwent changes. 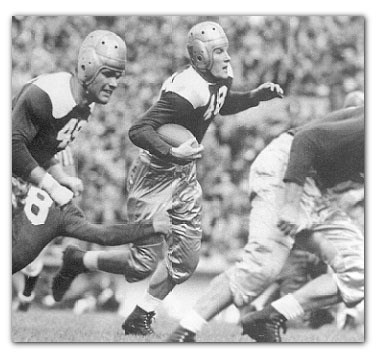 In a move unpopular among many Irish fans, gold flanks were added to the sides of the jersey (right). 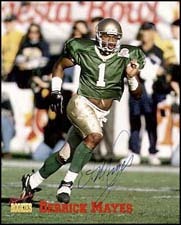 Davie’s one use of the green jersey also turned out to be unsuccessful, as the Irish donned the green against Georgia Tech in the ’99 Gator Bowl and lost, 35-28. The regular Adidas-made uniforms remained the same under Willingham until 2004 when they underwent several changes. 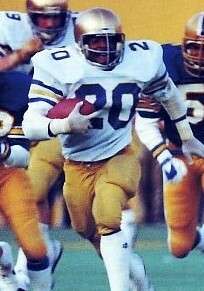 The green shamrock and small script Irish were replaced with a small interlocking ND logo while the logo on the front of the pants was changed from green to blue. 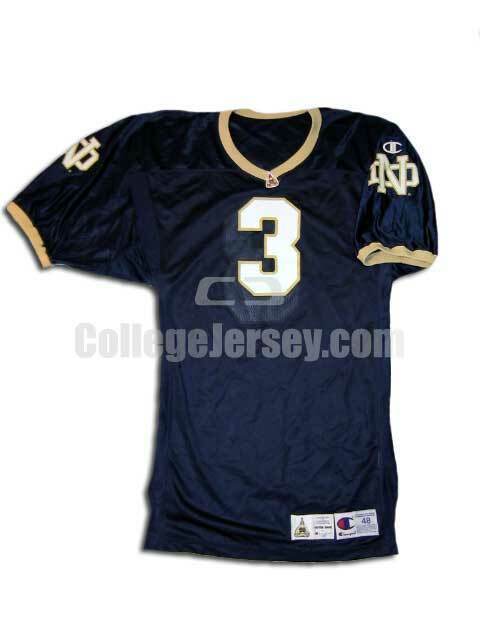 The ND logo on the shoulder sleeves was replaced with the number of the player and the gold flanks were finally removed from the away uniforms. Like his predecessor, Willingham’s one attempt at the magic of the green jersey ended in failure. 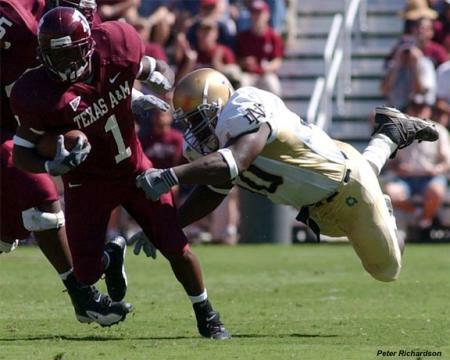 After starting out the 2002 season 8-0 and ascending to the #4 ranking in the nation, the Irish were set to face Boston College. The students and many fans had been wearing that year’s “The Shirt”, which in its many printings evolved into a bright neon-green color. 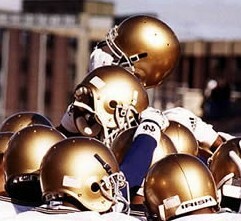 The Irish played terribly in the game, losing three of seven fumbles and losing by a score of 14-7. This last appearance of the green left a bad taste in the mouth of many Irish fans, and I think it's safe to say that most Irish faithful are probably leery of seeing the green again anytime soon. It's not clear that Charlie Weis has any changes planned for the uniforms (as of yet), and if we can use the spring game as a guide, then it looks like the uniforms will be exactly the same as last year's. As far as the green goes...during his 6am "wakeup" meeting with the students during his first days on campus, someone asked Charlie about the green jerseys, and requested that we only use those for the big games. Charlie said something to the effect of, "That rah rah stuff only lasts about 10 minutes. Preparation is the reason you win -- not emotions. Emotions can carry you only through part of the 1st quarter and then it comes down to who is better prepared." So look for Charlie to not do anything radical with the uniforms, and don't hold your breath waiting for him to use the green jerseys as a motivational ploy. That doesn't seem to be Charlie's style. 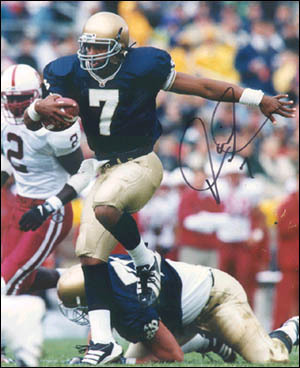 In conclusion, if you were to ask the average ND fan what his or her idea of the traditional uniform was, you would likely get the following response: an unadorned gold helmet, a simple navy blue jersey, and plain gold pants. No names on the back...no designs on the helmet. Classic and elegant. And above all, traditional, right? Yet it's interesting to note that the "traditional" style of uniform was only worn from ‘64-’77, and again from ’86 to the present. It's just so damned beautiful, no matter the era. 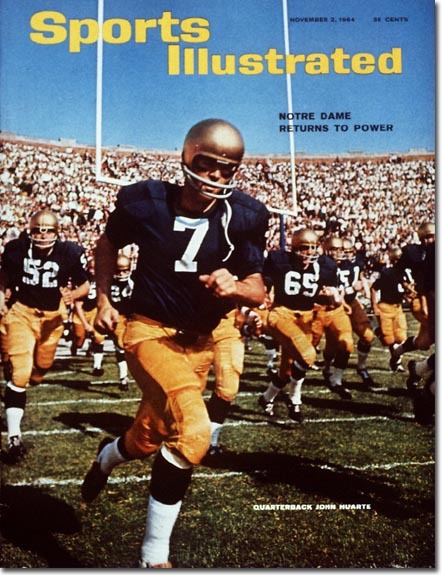 Since the 1977 USC game, the green jersey has taken on a slightly different significance then it did under Rockne and Leahy. 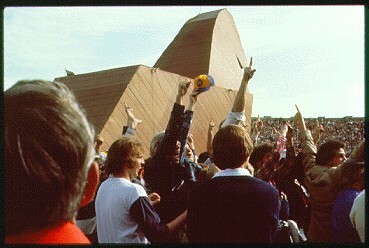 It is now associated with a special occasion, or a motivational ploy for an important game. 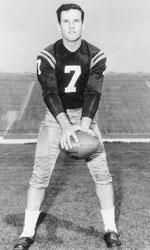 Including the ’77 USC game, the jersey has been worn on 7 occasions. Notre Dame’s record in these games is 4-3 with the past 3 games all resulting in a loss. 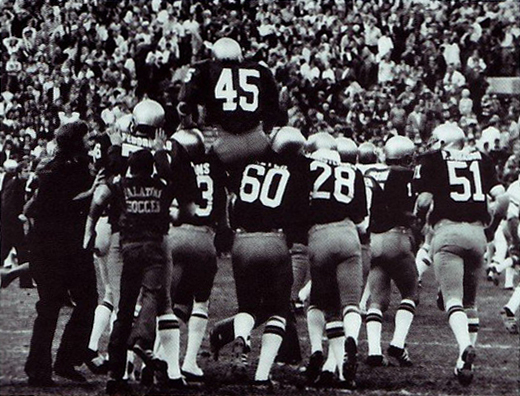 1977 vs. USC: (above right) This game matched 11th ranked ND against 5th ranked USC. 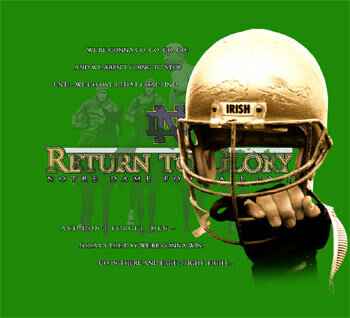 The inspired Irish destroyed the Trojans 49-19, a win that propelled ND to their 10th National Championship. 1992 Sugar Bowl vs. Florida: (second from top) The Irish were the underdogs in this game to the 3rd ranked Gators. 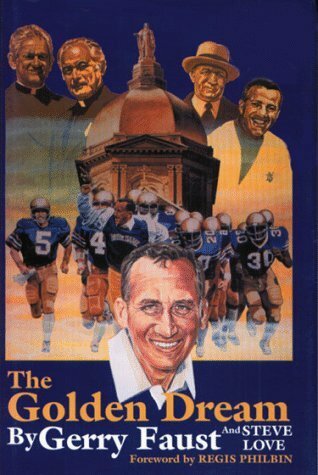 As Lou Holtz explained, “I was having dinner with my family at a restaurant just prior to taking the team to New Orleans in 1991, and our waiter came up and said, 'What's the difference between Cheerios and Notre Dame? Cheerios belong in a bowl.' That didn't make me feel real good and when I repeated it to our players in New Orleans, I think they understood how our team was viewed coming into the Sugar Bowl.” The Irish, clad in white jerseys with green numbers, beat Florida 39-28. Within a week after the Sugar Bowl victory, General Mills-maker of Cheerios-sent 120 boxes of the breakfast cereal to Holtz with a note that said, "Like the Fighting Irish, we have been one of America's favorites for years. And as your team dramatically proved, both do belong in bowls." 1985 vs. USC: Both teams were mediocre at the time, the Irish would finish the year 5-6 while the Trojans would end up 6-6. Gerry Faust's 1985 team took a 27-0 halftime lead against USC and then donned the green jerseys for the second half, en route to a 37-3 win. 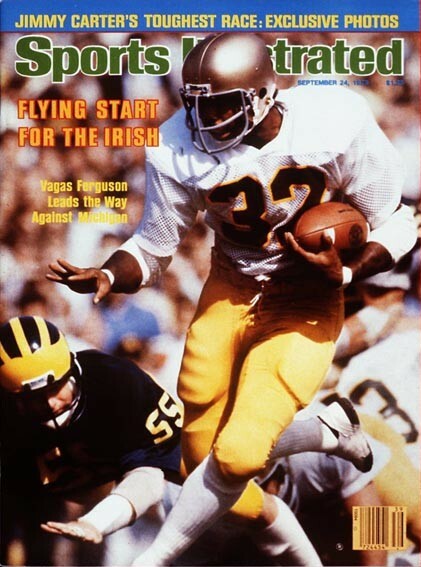 1983 vs. USC: Faust’s first use of the green jerseys resulted in a 27-6 win over a USC team that finish the season 4-6-1. 1995 Fiesta Bowl vs. Colorado: (middle picture) The magic of the green was not enough for the unranked Irish to beat #4 ranked Colorado. ND was crushed 41-24 and would end up the season with a record of 6-5-1. 1999 Gator Bowl vs. Georgia Tech: (second from bottom) Bob Davie’s one attempt at the green jerseys resulted in a 35-28 loss to the Yellow Jackets. 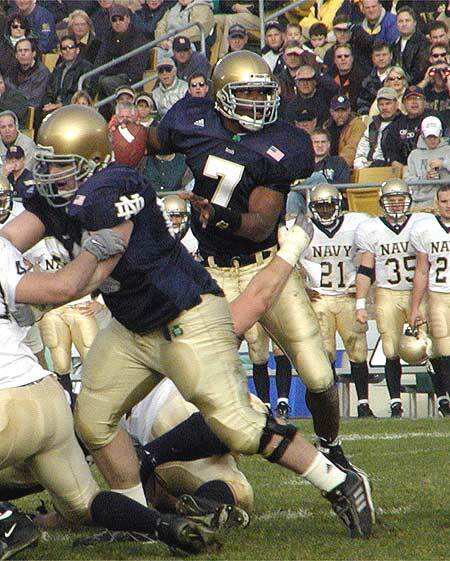 2002 vs. Boston College: (bottom right) The heavily favored Irish played terribly against Boston College, losing 14-7. This game would start a downward spiral for Coach Willingham with ND losing 10 of their next 17 games.